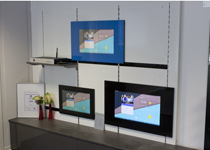 Visit our exhibition in Salzkotten and experience our products live on site. A 24 inch LCD compact module with the dimensions 500 x 800 mm, painted in RAL 5012 light blue. The separate Mediabox was equipped with an Android operating system. 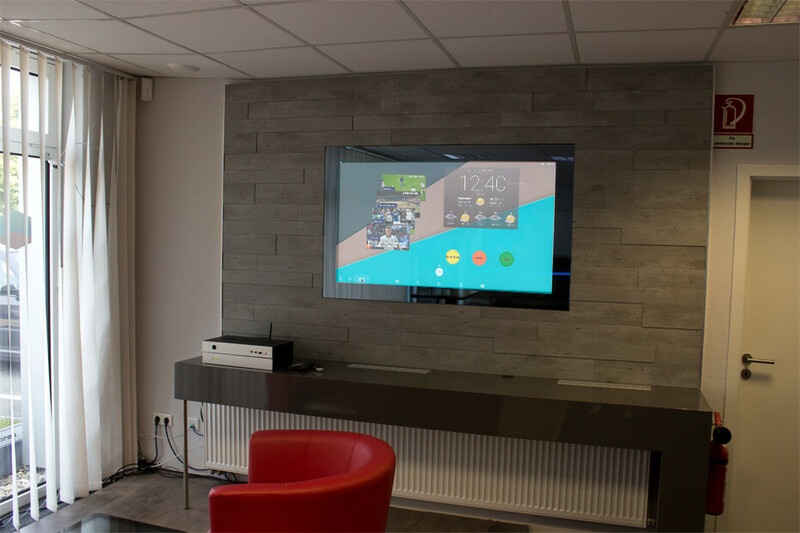 The display can be operated comfortably via touch. One of our LCD compact modules, painted in RAL 9005 black, with the dimensions 400 x 600 mm and an integrated 21.5 inches LCD display. With an equipped Android operating system, you can easily access content from apps and the Internet. Another of our LCD compact modules with the dimensions 550 x 900 mm and an integrated 27 inches LCD display. This compact module was painted black in RAL 9005. The Android operating system can be operated very easily by touch. Also in our exhibition to find a 27 inches LCD kitchen back wall with the dimensions 1998 x 560 mm. 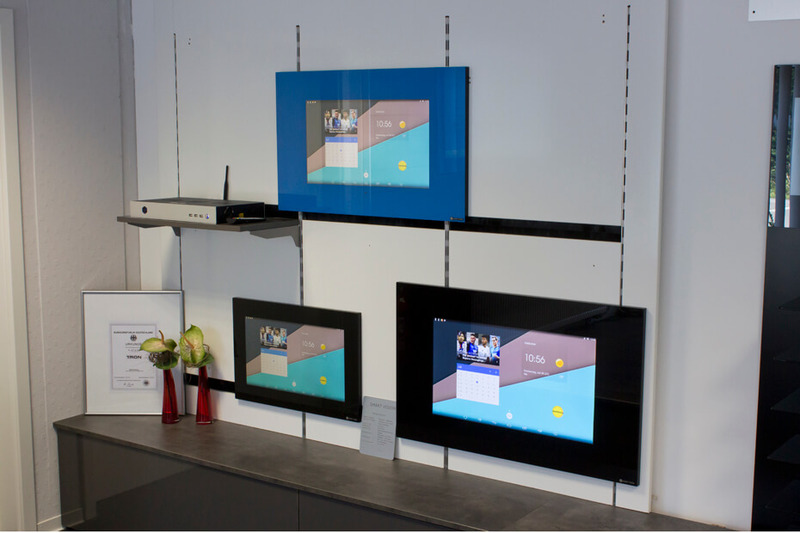 The surface consists of painted glass, in the RAL color 9005 black, behind which is an integrated LCD display. 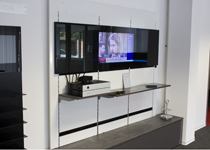 The separately connected Mediabox offers television in brilliant full HD. 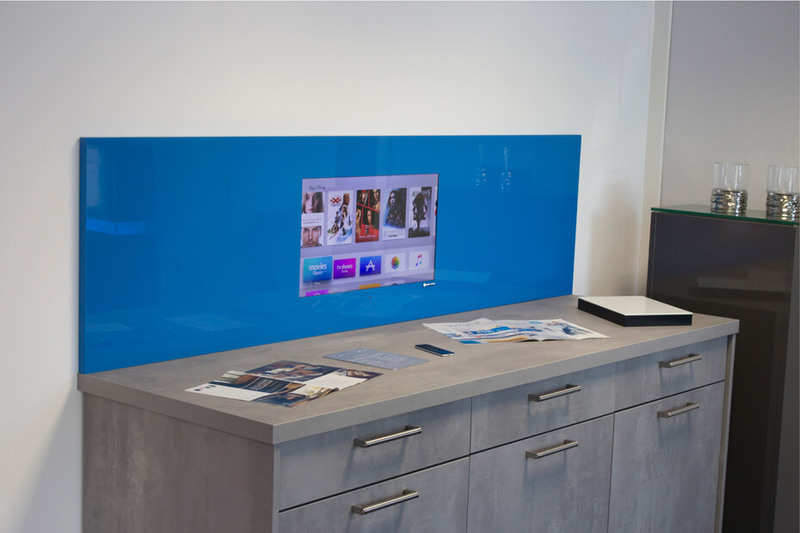 One of our special highlights, from our SMART VISION exhibition, is a blue LCD kitchen back wall. It has the dimensions 1850 x 500 mm and was painted in RAL 5015 sky blue. Behind the glass surface is a 24 inches LCD display. 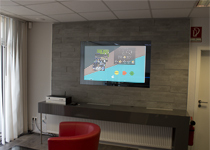 In the Mediabox is an Apple TV equipment package, which can be controlled by a remote control. Finally, we present you a 55 inches LCD glass back wall, with mirror effect glass painted in RAL 9005 black and the dimensions 1395 x 865 mm. Once the integrated LCD display is switched off, the glass screen looks like a mirror. 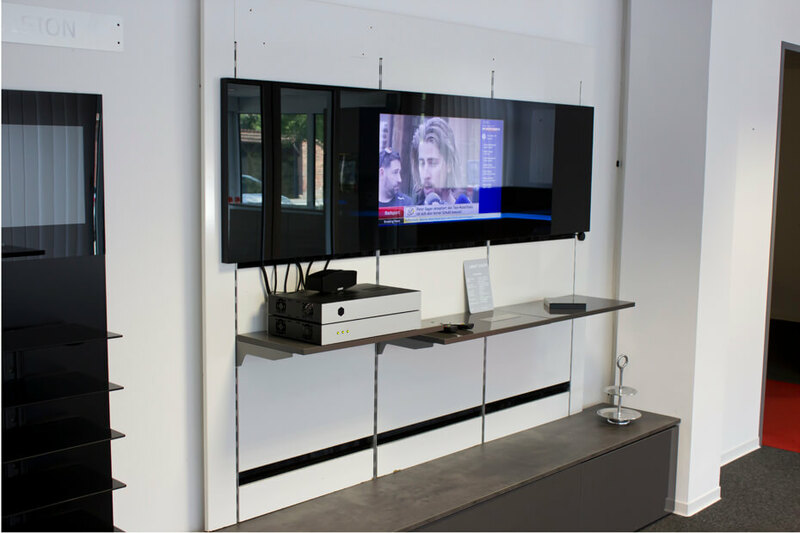 The external Mediabox was equipped with a smart Android module for apps and the Internet and a satellite receiver for brilliant HD television.